Sometimes I look in the fridge and think, "what am I going to do with all of this random stuff?" While it seemed pretty empty around the holidays, during some point in January, the fridge suffered from a glut of various half-full jars and plastic containers. Add to that a bunch of fresh vegetables because I was starting to feel guilty about eating so poorly in the weeks between Thanksgiving and mid-January. Among other things, we purchased a celery root so I could make one of my new favorite salads, celeri remoulade. I'm not a big fan of celery, but I loooove celeriac. Love it. But woman (and certainly not the man in this house) can't live on celery root alone, so I had to think of something more substantial to eat it with. Luckily, one of the myriad containers held about half of a rotisserie chicken. Another container held about half a cup of cranberry sauce left over from the fruitcake I made for my dad. Yes, I realize that I made that cake a month prior, but the sauce was still fine (acidy things tend to keep well under refrigeration). That became the starting point for a barbecue sauce. Where am I going with all of this? 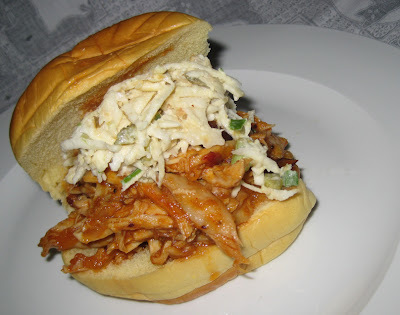 Why, it's a riff on a classic pulled pork sandwich with cole slaw. Only it's pulled chicken with celeri remoulade. And it was quite delicious, if I do say so myself. If you don't like celeriac, feel free to substitute your favorite cole slaw. In a saucepan, cook onion in a dribble of olive oil and a pinch of salt until soft and translucent. Add next 10 ingredients and bring to a boil. Lower heat and cook 5 minutes. Add chicken and stir well to coat with sauce. Cook for 15-20 minutes until warmed through. Serve on potato rolls with celeri remoulade.